Hello everyone, hope your weekend is going well. Just a really quick post..................I am running all late this weekend, my daughter is on her way to the Big Apple on a school trip as I write, so last night sort of disappeared rather quickly. And with it being half term here in the UK, I will have my youngest granddaughter to keep occupied this week, so my craft room is likely to be taken over........we have Christmas crackers on the agenda along with some more cards. And here is Berit's card, please mail me with your full postal addy so I can get your prize off to you, I'm not sure which Country you are in, but hopefully it won't take too long to reach you. 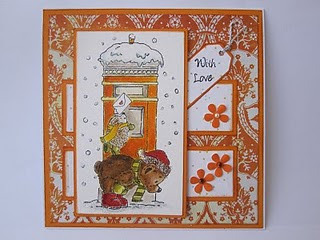 You still have a few more days to enter this months challenge where there are some super stamps to be won. A very good morning to you all, how's your week been ? It's been decidedly chilly here in the Cambridgeshire Fens, yet the leaves are still hanging onto their green hues and those beautiful Autumnal colours we usually expect to see by now are slow to develop. It all goes with the rest of our strange weather this year I guess. But looking at some of the pictures on your blogs, especially our friends from across the pond, your season is in full swing and looking absolutely beautiful and providing wonderful inspiration judging by your entries this week. 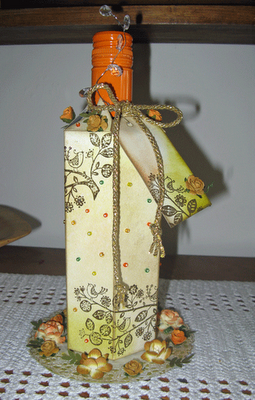 Congratulations Heidi, please mail me brenda@ibas.co.uk with your full postal addy. And here is Hedi'ds lovely card. So what ever was Mr Blogger up to yesterday ? From what I read lots of you had the same problems as well, no dashboard....how worrying was that ? I do hope us frenetic crafters aren't getting too much for him to cope with. Things do seem improved this morning so fingers crossed it was just a blip. Well done Tracy, please mail me brenda@ibas.co.uk with you post addy so I can get your prize off to you. 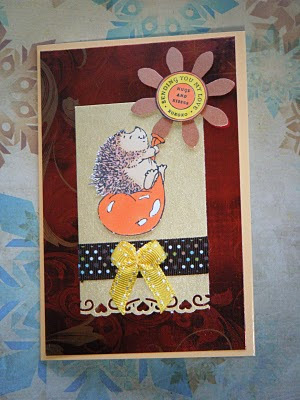 Here is Tracy's lovely card.....I just love that poppy stamp and the elegant card Tracy has created with it. And don't forget, there will be a winner each week this month and you can enter each week if you like, as long as it's a new piece of work and of course all entries will go into the pot at the end of the month as well. So four chances of winning this month, how cool is that. 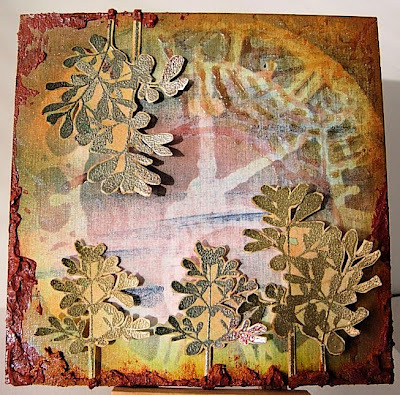 And a reminder to you all that there is loads of inspiration to be had at Penny Black's revamped blog, do hop over and feast your eyes on the work on display.